The iconic Volkswagen Golf is to move from the road to the racetrack, the German brand has announced. Based on the seventh-generation Golf, the 329bhp concept car has been assembled in accordance with TCR regulations. Volkswagen created the car in order to evaluate interest in a potential customer-racing program that would join the 2016 season. In order to hasten the development of the Golf TCR, it will be tested under racing conditions in this weekend's TCR International Series at the Red Bull Ring. The Liqui Moly Team Engstler will be responsible for the running of the car at this, and the three other remaining events in the 2015 season. Volkswagen Motorsport Director Jost Capito commented: "The newly created TCR category provides a promising platform for customer racing  on a national and international level. With exciting races, production-based technology and reasonable costs, it offers a new outlook for private racing teams." He continued: "When developing the Golf-based concept car, we are able to fall back on the resources at Volkswagen. This reduces both development time and costs." 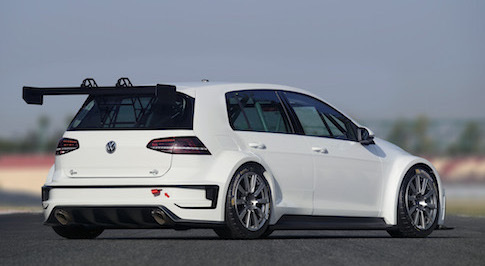 The Golf TCR boasts a sporty, 'ready to race' aesthetic with 18-inch racing rims, a chassis that is roughly 40cm wider than that of the production Golf and a prominent carbon rear wing. A powerful 2-litre, four-cylinder engine, DSG gearbox with steering-wheel mounted shift paddles and a racing developed chassis ensure the Golf is racetrack ready whilst the racing seat with head protectors, the racing safety cell and the safety tank mean the driver will be protected in accordance with FIA regulations.